Attend for FREE! Fill out the Grant Application. This year's Center for Innovation In Education's Summer Institute is Innovating in Education for Maine’s Diverse Population of Students. Maine Educators serve a diverse population of students including rural, at-risk, and immigrant populations. During the 2018 CIE Summer Institute, we will focus on innovations in education to serve the needs of the diverse population of Maine students. Particular emphasis will be placed on the following innovative educational strategies: STEAM, Proficiency, and Digital Learning. Limited grants are available to support registration costs. This spring MMSA is bringing together K-12 educators from across the state of Maine to build networks, learn from each other, and celebrate our successes implementing change. This event joins participants and partners in MMSA’s programming providing a unique opportunity to link formal and informal educators as we build a STEM education movement in Maine. Registration is $20 and includes continental breakfast and lunch. Your district didn't send you to the national NCTM conference this year? You can still watch the four Shadowcon presentations, and sign up for a month long conversation with the presenters! Check out more on Dan Meyers blog post. The NCTM/NCSM Teacher-Leader Professional Learning Grant will cover up to $4,000 of professional development costs for your district. The PD must be centered around either "Formative Assessment, Digital Learning or Access-Equity-Empowerment. Costs may include consultant honoraria (no gifts) and expenses, materials, books, and substitute time. While this grant does not fund the purchase of technology, proposals including professional learning involving the use of technology are encouraged. Proposals must address the following: need (include data), mathematics content, scope of the plan, other sources of funding, number of teachers and students impacted, distribution of costs, private, suburban, urban or rural-isolation context, and demographics of student body." Due Oct. 13, 2017. Follow the link on https://atomim.wildapricot.org for more information. Registration for ATMNE 2017 is open! Registration for ATMNE Fall Conference 2017 is open! Steve Leinwand "has served on the NCTM Board of Directors and has been President of the National Council of Supervisors of Mathematics. Steve is also an author of several mathematics textbooks and has written numerous articles. His books, Sensible Mathematics: A Guide for School Leaders and Accessible Mathematics: 10 Instructional Shifts That Raise Student Achievement were published by Heinemann in 2012 and 2009 respectively. In April of 2015, Steve was honored to receive the National Council of Supervisors of Mathematics Ross Taylor/Glenn Gilbert National Mathematics Education Leadership Award." Eric Milou "has extensive speaking experience on standards based reform in mathematics. He is one of the authors of digits, Pearson all digital middle school textbook and was the recipient of the Max Sobel Outstanding Mathematics Educator Award in 2009." Grace Kelemanik "is a former urban school teacher and a project director for the Education Development Center. Grace is the co-founder of Fostering Math Practices, and a coauthor of the books Routines for Reasoning and The Fostering Geometric ThinkingTooklkit." Tracy Zager "is the author of Becoming the Math Teacher You Wish You'd Had: Ideas and Strategies from Vibrant Classrooms (Stenhouse, 2017), which grew out of Tracy's work with her colleagues as a math coach, and before that with pre-service teachers and their in-service mentors. Tracy is most in her element in classrooms, learning together with teachers and students over time. She currently splits her time between coaching and editing professional development books for teachers." Best Western Royal Hotel and Trade Center in Marlborough, MA will host this conference on Nov. 2 and 3, 2017. For more information check out the conference website. Save with an early bird registration. 2017-2018 Here we come! Ready to take on the challenge of a new school year? Looking for some fresh ideas? Check out these blogs for some new inspiration. 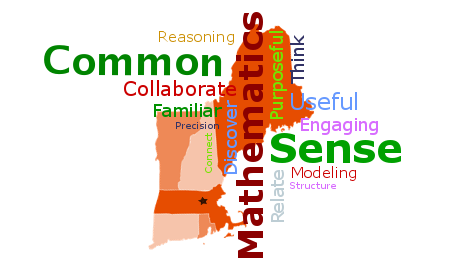 Here are a list of blogs that present current ideas in Math. Of course these are the opinions of individuals, therefore we do not take responsibility as an association for what the links might contain. The Maine Department of Education anticipates needing to form ad hoc committees over the next year to complete a variety of necessary work. Some work relates to our accountability system. Other work may focus on standards and proficiency. Serving on a state level committee, whether for a day or several days, is a meaningful professional learning opportunity and demonstrates systemic thinking. In order to be ready to reach out to qualified practitioners, Maine DOE has opened up a volunteer registry for Mathematics and English Language Arts/Literacy. Teachers and administrators with content expertise are invited to register through a Survey Monkey and be entered into a database for use as needed throughout the next year. Remember, you can always refuse when called. Registering for consideration is not a guarantee that you will be selected. Please consider taking a minute to compete the registry today. Your participation is needed and appreciated. If you have questions about this registry, you may contact ELA Specialist morgan.dunton@maine.gov, Literacy Specialist l Leeann.Larsen@maine.gov , Elementary Mathematics SpecialistCheryl.Tobey@maine.gov, and MS/HS Mathematics Specialist Michele.R.Mailhot@maine.gov . Jo Boaler presents the value in believing in yourself, your children and the struggle in Mathematics (Maths). This 13 minute video is worth watching. Jo shows us the brain research, the creativity, the possibilities, and the fun in Math.